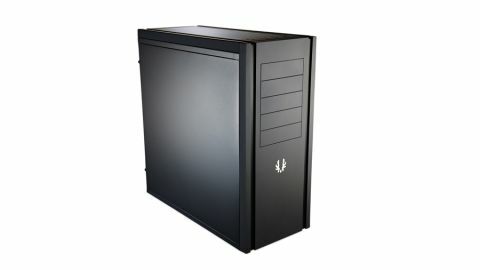 A well-built case, but can you really please all the people? Firmly targeting as many performance and enthusiast PC users as it can, the Bitfenix Shinobi XL is a full tower chassis that ticks plenty of contemporary boxes. For instance, it has four USB 3.0 ports and a very welcome fast-charging port mounted on top, along with ample room and support for water cooling, plus motherboard support up to AL-ATX. As a home for a top-class Ivy Bridge rig, with a suitably beefy graphics card, it's unlikely to disappoint. And crucially, even packed with components, there's still plenty of room inside. The Shinobi XL is an evolution of Bitfenix's well-received Shinobi case. The XL suffix gives it away: it's basically bigger, although it doesn't have the visual glitz of Bitfenix's previous Colossus cases. A lot of thought has gone into the construction of the Shinobi XL, making it a straightforward chassis to build a PC with. For instance, there are very clear markings to show where the stand-offs should go for different-sized boards. Although hardly radical, the cable routing is comfortable, with four banks of rubber grommets around and under the board. There's ample room to keep things organised and tidy, as you'd expect in a case this size. The stock cooling is good, provided by three installed fans. Bitfenix offers space for a further nine, but then it's also keen to cater for water coolers. This is a slightly odd choice: a more specialised water-cooling chassis would be a better proposition than one that mixes and matches a little as the Shinobi XL does. Still, there are four rubberised grommets to thread hoses out of the back of the case, along with a number of radiator positioning options. Also, and we admit we're getting a bit picky here, the individual drive caddies feel a little cheap and flimsy. Once your drives are installed though there's little need to bother with them. You can, incidentally, remove the hard drive cage altogether should you wish, and you may need to, depending on what expansion cards you're trying to fit. There's also a clear desire to provide value for money, including that fast-charging USB port, for instance, is a real bonus, but you'll still find odd pockets of economising in what's meant to be a premium-positioned case. You also get the feeling that, in spite of its water-cooling support, a more specialised case remains a better option for that. There's a lot to like about the Shinobi XL though, with the stylish, classy design and the soft rubberised finish adding a premium feel to the exterior. Inside, it's an adaptable, flexible chassis, and a thoughtfully designed one. Given the size and asking price though, it doesn't seem unreasonable to expect just a little more.